11th Congress of Sigtur (Southern Initiative on Globalisation and Trade Union Rights) was held at Buenos Aires, a Capital City of Argentina from 3rd to 5th April 2018. Delegates from the following countries attended the Congress - Argentina, Australia, India, Japan, Brassil, South Korea, South Africa, Malaysia, Fillipines, Tunesia, Paraguay and Uruguay. 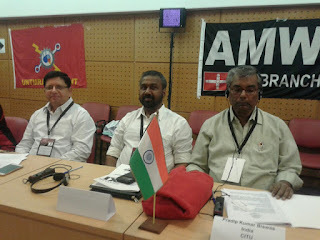 The leaders from the Canada and United States Trade Union movement also addressed the congress. Indian delegation was represented by Com: Pradip Biswas (BEFI), Com.M.Krishnan (Confederation of Central Govt. Employees & Workers) and Com. Sreekanth Misra (AIIEA). The host organisation was CTA Autonoma Argentina (Confederation of Workers of Argentina - Autonomous). The opening session of the Congress was held on 3rd April 2018 at 3 PM. Leaders of the delegations of each country made a brief address in opening session. On behalf of India, Com. Pradip Biswas addressed. The delegate session of the Congress commenced on 4th April at 10 AM. In the begining, “country reports” were presented by the laders of each delegation. Com: Pradip Biswas, leader of Indian delegation presented the country report of India. In the brief report about Indian situation, the slow down of the economy, unemployment, job loss, decline in real income, price rise of essential commodities, agricultural crisis, widening disparity between rich and poor, privatiation of public sector undertakings and Government departments, Labour reforms, attack on social security, large scale outsourcing and contractorisation etc. are explained. The united resistance of the Trade Union movement against the neo-liberal policies including seventeen All India Strikes, the three days maha dharna with the participation of lakhs of workers which stormed the capital city, New Delhi, country-wide struggle of the farmers with special mention of Mumbai March was also reported. After the presentation of country reports, a presentation on global campaign on Asbestoes-free world was made by the Australian delegation with power-point presentation explaining the ill-effects of Asbestoes and demanding complete ban on use of Asbestoes in all countries. A resolution was also adopted in the Congress extending the full support of the SIGTUR for the campaign against asbestoes and for an Asbestoes free world. “One decade after the last big crisis of contemporary capitalism, it seems the leadership of the G-20 in the international system could barely guarantee a relative stabilisation of the financial system, but could not achieve substantial changes in order to improve workers lives. We now-a-days assist to a context of wealth concentration and growing inequality even in the advanced economies. G20 proposals in favour of “Structural reforms” actually mean a direct attack to worker’s rights, disintegration of collective negotiation, increase in working hours-labour flexibility and hostility towards Trade Unions. G-20 is both a challenge and an opportunity: trade unions have the chance for presenting their agenda and promote global policies with real effectiveness for workers welfare. We also must select the best strategies to work together in this context of technological change and social relations transformation. The G-20 events in Buenos Aires constitute a historical opportunity to think on new alternatives against Neo-liberalism that goes on concentrating wealth and marginalizing the people”. The SIGTUR Congress also adopted a resolution to organise massive rally of workers at Buenos Aires during the G-20 sumit protesting against the neo-liberal policies. The concluding session of the 2nd day was presentation of the futures Commission booklet “Challenging Corporate Capital: Creating an Alternative to Neo-liberalism”. The Futures Commission report was based on the key issues identified by the 2013 SIGTUR Conference. The contents of the booklet included Alternative to neo-liberalism, Labour and Tax justice. From free trade to fair trade, Democracy-driven public sector transformation, Alternative Conceptions for a “just transition” from fossile fuel capitalism and movement of the dispossessed. The presentation of the Future’s Commission booklet was made by Robert O’Brien of Canada. The third day of the Congress mainly devoted to panel presentation and discussions. Three countries were included in each panel and one to chair the session. The first panel presentation was on the subject - “Reduction of working hour without income or rights reduction”. The need for reorganisation of Trade Unions according to global value chains and the role of the SIGTUR was also discussed. On behalf of Indian delegation Com: Sreekanth Misra participated in the discussion. The second panel discussion was on the subject - “Universal Basic Income”. On behalf of Indian delegation Com.M.Krishnan presented the view points for discussion. In the discussion introduction of maximum income and ideas to tackle inequality was also focussed. The third panel discussion was on the subject - “The impact of 4th Industrial revolution and the role of labour plays in it”. The panel discusion was chaired by Com: Pradip Biswas, leader of Indian delegation. The final session included building a plan of action for the next years based on a resolution called SIGTUR XIth Congress resolution and also discussion about implementation/plan of action based on XI Congress resolutions. The following resolutions are adopted in the Congress. 1. Common resolution covering all the main issues discussed in the Congress and Programme of action for the future. 2. Resolution demanding immediate release of Com. Lula, Ex-President of Brazil from jail and allowing him all democratic rights as none of the charges against him are proved. 3. Resolution demanding immediate release of Korean Trade Union leaders who are imprisoned for participation in Trade Union activities. 4. Resolution condemning the fascist, undemocratic Government of Phillipines and demanding restoration of peoples democratic rights. 5. Resolution on campaign for Universal ban on Asbestoes. “Since the beginning of discussions, the ILO agenda on the future of work has been dominated by the northern, industrialised countries, in conjunction with increasing participation from employers group. There are two main scenarios being debated in this context: a threat to job creation due to advance of technology; and an increase in labour flexibility due to changes in the organisational work. For our perspective, coordination like SIGTUR should be able to intervene on this debate and take a stance, from the south, regarding the future of work we want. This stance should include radical proposals that strengthen labour and trade union rights, and that place decent work at the centre of the debate. For the upcoming XI Congress, the broad framework for discussion will be based on the idea of “Another work is possible”. This title intends to centre debates not on whether there will be work available in the future, but rather to put forward the kind of society we want to live and where work will be placed in that society”. A photo session was arranged and all the delegates participated in the photo session with the play-card written “Free Lula”. The XI SIGTUR Congress was a serious business and the topics it discussed are of universal importance. Intellectual and educative debate took place on each subject affecting the working class. The host organisation, CTA - Autonomous made excellent arrangements for the accommodation, food, transportation and conference halls, cultural programme etc. No doubt the XI SIGTUR Congress will be a milestone in the struggle of the working class against the neo-liberal globalisastion policies and also for the protection of trade union rights.